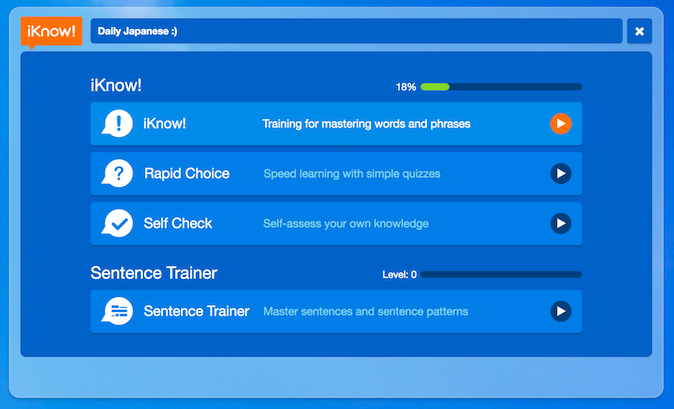 Custom Course Editor - iKnow! Welcome to iKnow! If you're a user from the Smart.fm days, don't worry--we have the same study apps, and all your data is still saved. Just log-in with your Smart.fm account and get started! and create original items and sentences. 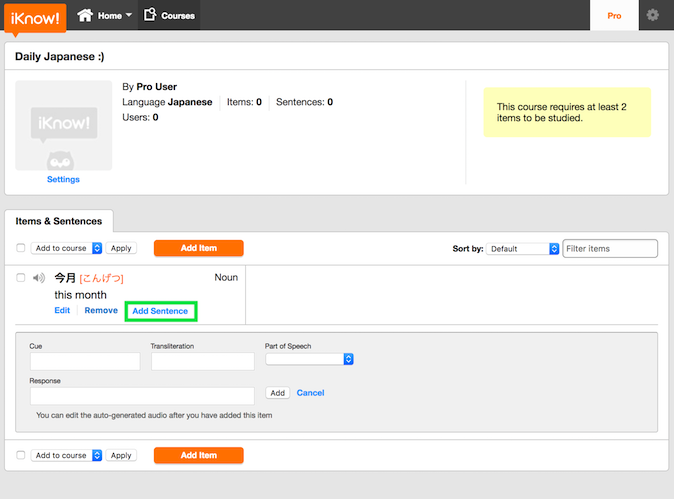 On the Custom tab, click the "Create a New Course" button. Choose a name for your course, set your language and the language you're learning, upload a course image (under 2MB) and click Create. 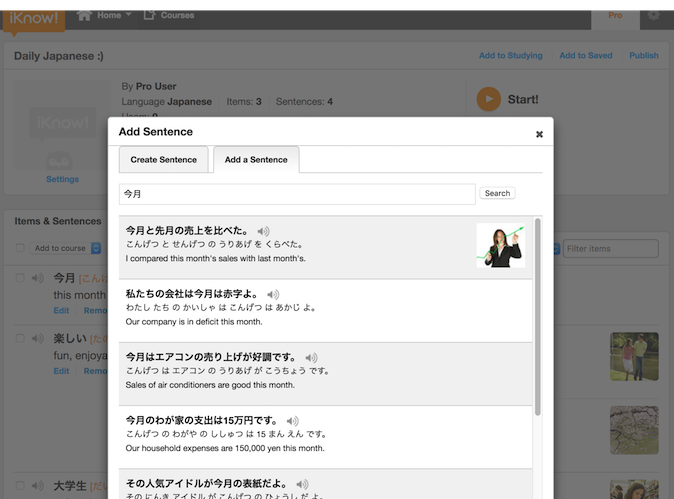 Official support is currently offered for Japanese, simplified Chinese, traditional Chinese, and English. Click "Add Items" to start building your course by creating study items. * To study a course, it must contain at least 10 items. * The maximum number of items a course can contain is 500. Enter the item (a word, phrase, or sentence), the response (the item translation), and part of speech. Autocomplete will assist you in the item creation process. * The maximum item length is 90 characters, and the maximum response length is 45 characters. 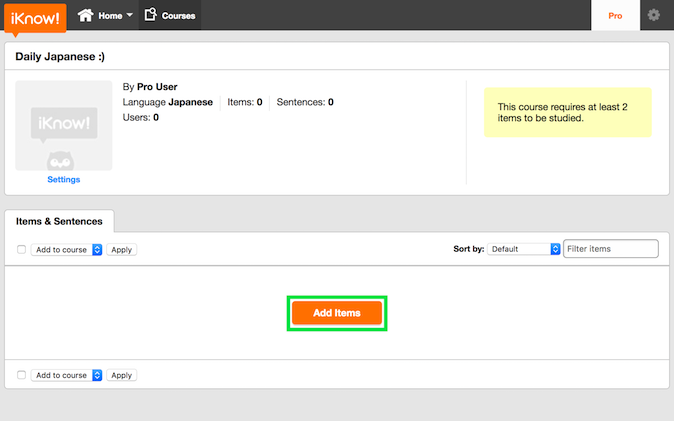 To import items, go to a course page and choose which items to add by clicking the checkbox next to each item. To select or deselect all items, click the top left checkbox. Choose "Add to course" and click “Apply”. 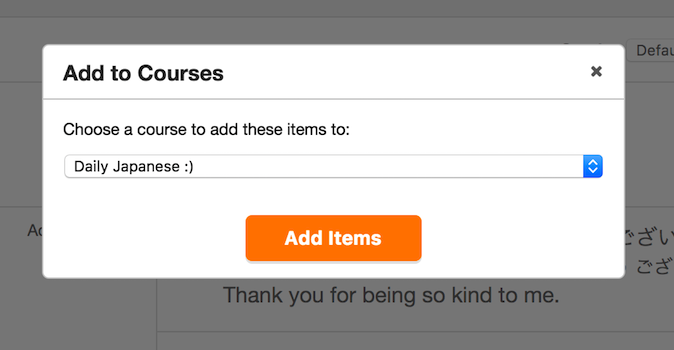 Then choose the course you want to add the item(s) to from the menu and click “Add Items”. Those items will then be added to the selected course. 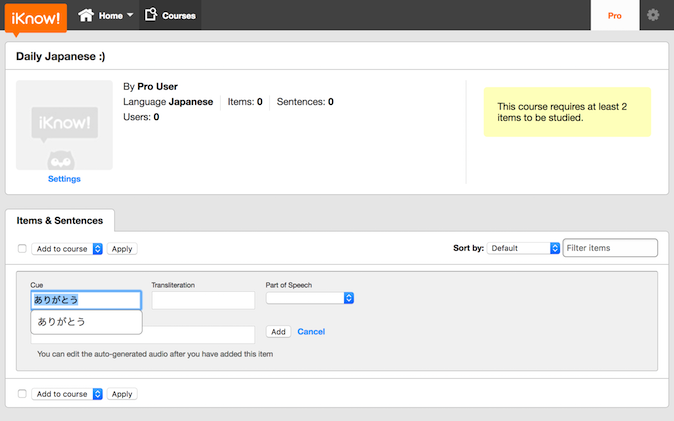 * You can only add items to a course with the corresponding language pair. 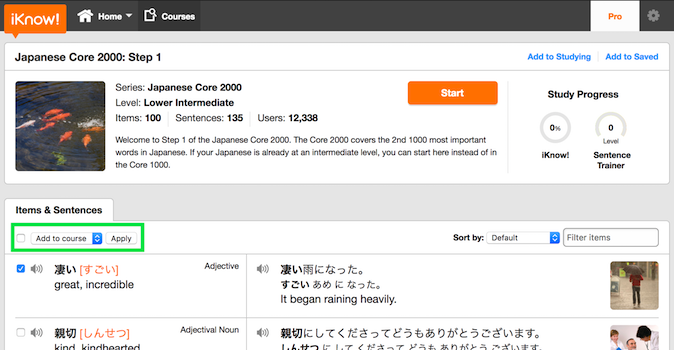 In other words, if the item is Japanese to English, only Japanese to English courses will appear as options. * The maximum number of items per course is 500. If you try to add over 500 items to any given course, you will see an error message. Click "Add Sentence" to start adding sentences to an item. To add an existing sentence from the system, choose a sentence from the "Add a Sentence" tab in the pop-up and click the "add" button. 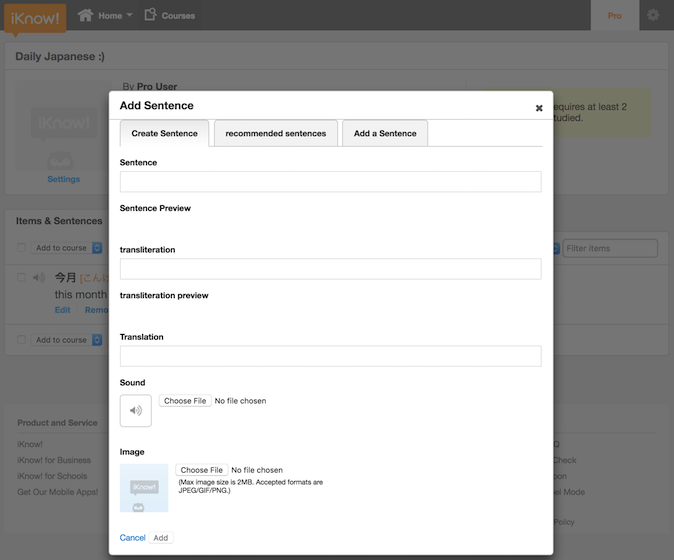 To create a new sentence, fill in the sentence and translation fields in the "Create Sentence" tab. You can also add an image and audio file for it (maximum size 2MB each). I would like to *go* there. * The maximum sentence length is 180 characters. * You can add up to five sentences per item. 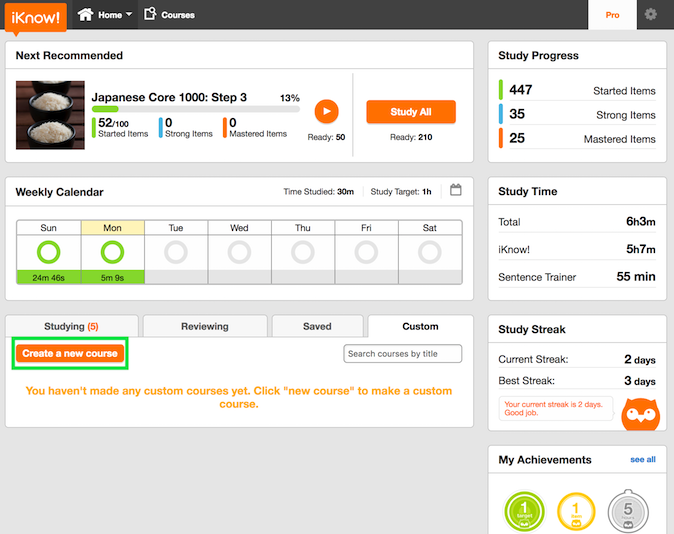 Any courses you create will be visible from the "Custom" tab in the "Home" page. To study a custom course, click the play button on it. The iKnow! application will then launch and you can get started!